In recent years, as government agencies have encouraged faith-based organizations to help ensure social welfare, many black churches have received grants to provide services to their neighborhoods’ poorest residents. This collaboration, activist churches explain, is a way of enacting their faith and helping their neighborhoods. But as Michael Leo Owens demonstrates in God and Government in the Ghetto, this alliance also serves as a means for black clergy to reaffirm their political leadership and reposition moral authority in black civil society. 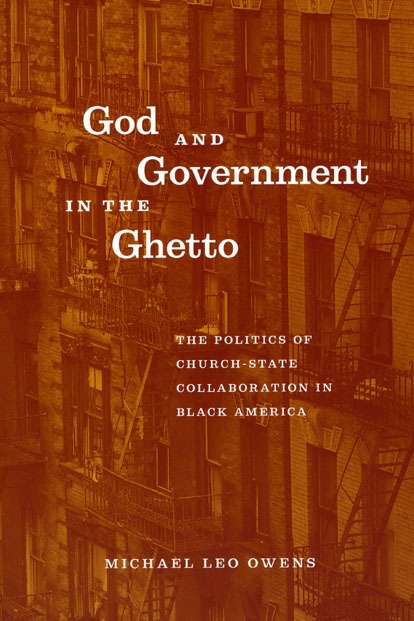 Drawing on both survey data and fieldwork in New York City, Owens reveals that African American churches can use these newly forged connections with public agencies to influence policy and government responsiveness in a way that reaches beyond traditional electoral or protest politics. The churches and neighborhoods, Owens argues, can see a real benefit from that influence—but it may come at the expense of less involvement at the grassroots. Anyone with a stake in the changing strategies employed by churches as they fight for social justice will find God and Government in the Ghetto compelling reading. "A useful account of the operation of FBOs ’in the trenches’ in the nation’s largest city. Owens strikes a balance between providing details of local situations with a theoretically (and politically) sophisticated account of the motives of various participants. The book is an excellent read and deserves the attention of scholars interested in the problems of urban poverty, and those whose primary focus is the relationship between religion and politics." "Students of religion and public policy will learn much from this book. . . . With this research, we can now better understand the process of church-state collaboration." "Using an effective mixture of surveys, interviews, and observation, Owens delineates the benefits and challenges for religious organizations in collaborating with government bodies and agencies to develop housing. . . . Owens develops sound theoretical arguments, moving beyond past definitions of patronage, co-optation, and church-government relationships in general to provide a carefully nuanced set of terms and definitions with pragmatic and philosophical value for the future of faith-based initiatives."